Located down a quiet and very private cul de sac on the five star Shorefield Country park at Milford on Sea near Lymington (as featured in the Sunday Mirror Travel) and only 12 miles from Bournemouth. Boasting an abundance of places to enjoy for all with a few minutes drive and also some great days out including Isle of Wight, Christchurch, Beaulieu to name a few. There is also plenty to do on the doorstep which is easily explored by cycle or on foot. Our well appointed lodge which is surrounded by a gated veranda has 2 bedrooms and 2 bathrooms (one en-suite with bath), fully furnished and rental includes all bed linen, and cleaner at the end of your stay. You will need your own towels for accommodation and pools. There are indoor and outdoor swimming pools, onsite spa (Reflections at Shorefield) and entertainment (including bingo and quiz nights) if required (Additional charges payable direct to Shorefield Country Park). Shorefield Country Park also has a restaurant, bar, small arcade and a well stocked shop. The beach is only a short stroll down the lane where you can enjoy views to the Needles and walk via a coastal footpath as far as Hurst Castle. Thank you for your much appreciated review. We are glad you enjoyed your break. The carpet replacement is scheduled for next month. Needed a base to stay over the Christmas period to accommodate myself, my partner and my elderly mother and this fitted the bill. We forfeited the large master with en-suite to my mother but she found the bed hard, luckily there were spare mattress toppers to make it comfortable. The small twin room wasn't ideally suited to two adults. John, the owner, was a pleasure to deal with and very accommodating. 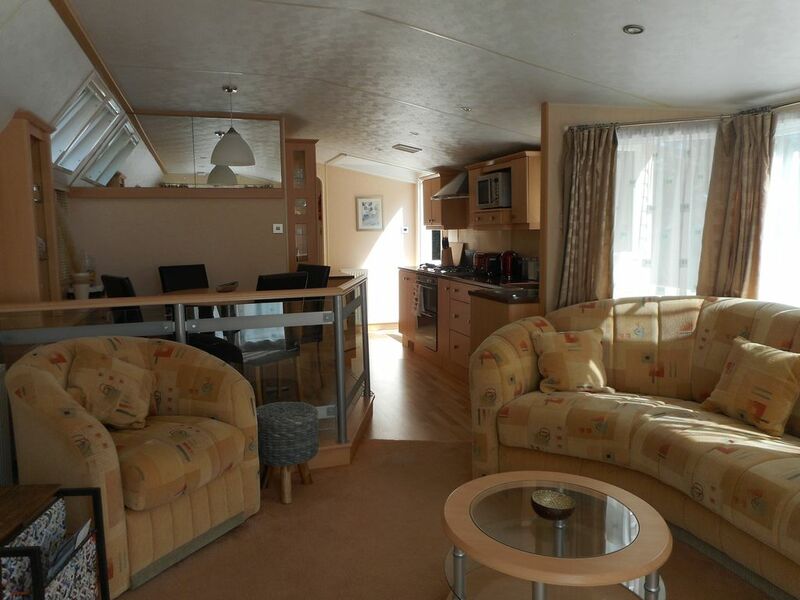 Heating, showers,kitchen etc all great and the general decoration was bright and welcoming. A very nice stay, thank you. We thoroughly enjoyed our stay. The caravan was excellent and had everything we needed. Very comfortable accommodation. When we arrived we were pleasatly supprised. The unit was very clean, there was more kitchen utencils than expected, The tv was good with enough channels to satisfie everyone. Plenty of storage space, Plenty of hot water, and the heating(which was needed on our last day,) was excellent. Also the amenities on site were very good, shop restaurant, swimming pool, live entertainment, plus other activities. Shorefield Park is extremely well maintained and has every amenity you could wish for plus an excellent pub,the Royal Oak, close by.The caravan is nicely situated in a cul de sac and is generally well equipped with TVs,internet and kitchen equipment.This van would have been a real eye catcher when new but sadly is looking rather tired with flooring and some upholstery needing TLC or replacing.Unfortunately we could not use the sink in the shower room as the plug was jammed in the plug hole and could not be fixed during our stay. This is the most expensive rental we have used so we were expecting something a little better. I'm pleased you enjoyed your stay. Confused about the plug in sink as it's my understanding that this was repaired upon your arrival and notifying us. Other comments taken on board and always gratefully received.